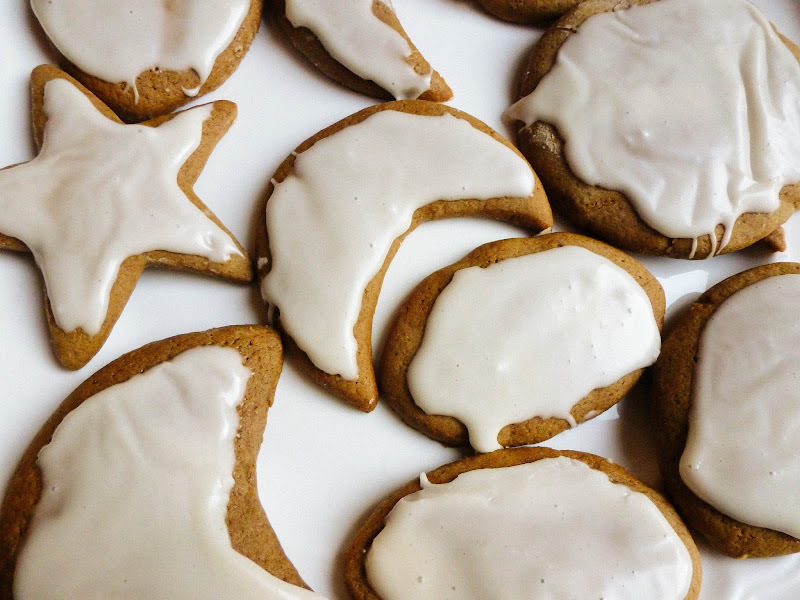 Rabbit in the Moon cookies. 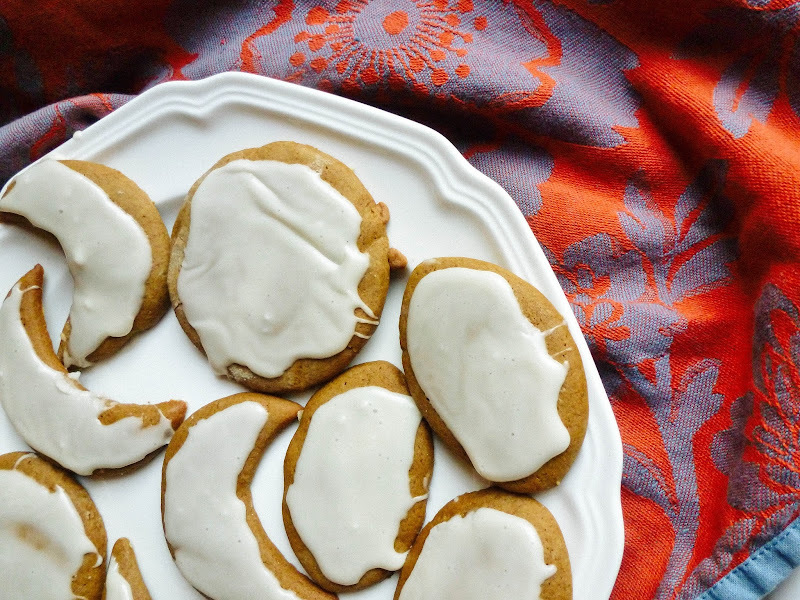 Aka gingerbread cookies with vanilla glaze. Aka I was too lazy to attempt the moon cake recipe in the book I profiled yesterday. 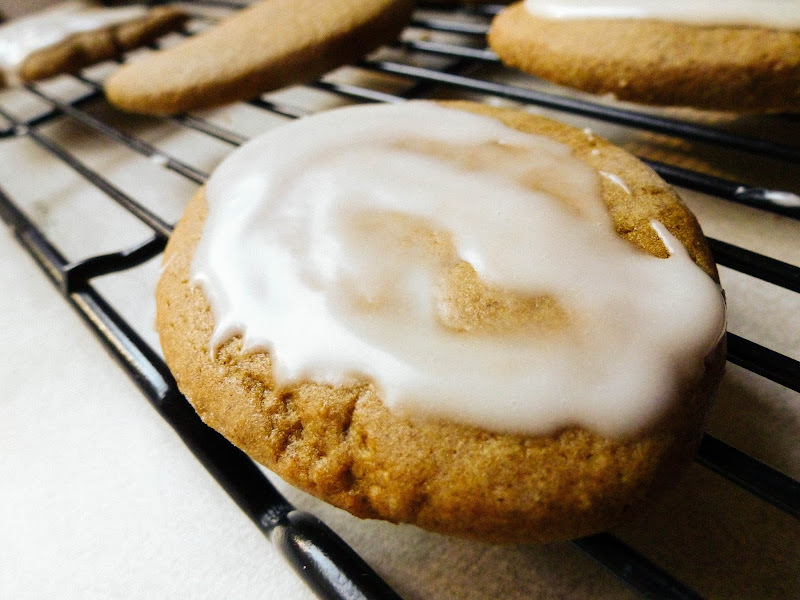 But the book said it was also ok to make these cookies, so I did. And they were very nice INDEED. Julia loved them with and without the glaze. Mix together the flour, spices, and baking soda, set aside. In a large mixing bowl, beat the butter and sugar with an electric mixer until light and fluffy, about 5 minutes. Add the molasses and the egg and mix well. Gradually add the flour mix and mix to a rough dough. Wrap dough in plastic wrap and refrigerate for at least 2 hours, or overnight. Press scraps together and chill, while you roll out the 2nd half of dough. 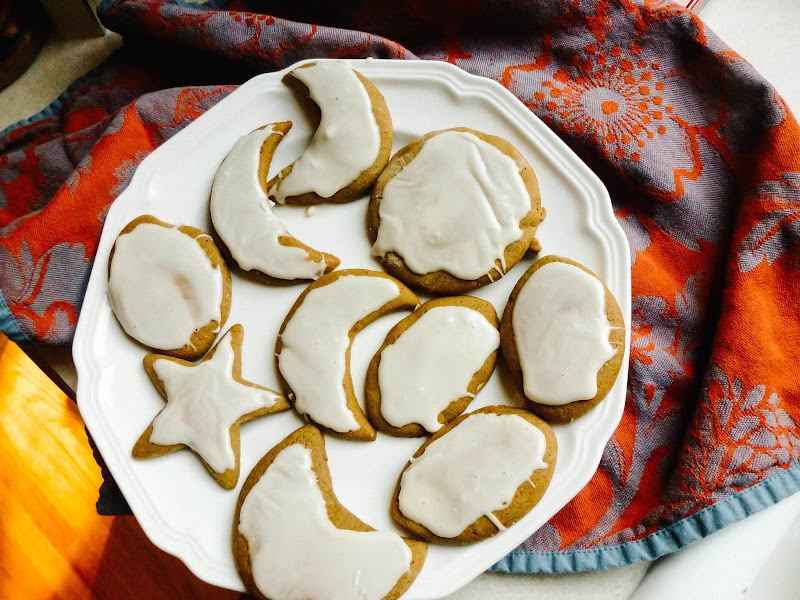 Reroll the scraps and continue making cookie shapes until dough is used up. Bake cookies for 9-12 minutes. Transfer to wire racks to cool. Prepare frosting by mixing all the frosting ingredients with a wooden spoon. Spread on cookies with a spoon (that's what we did) or if you use that extra half cup of sugar and have a thicker consistency, you could pipe on using a pastry bag. I love gingerbread cookies!!! But I never had them with vanilla glaze before. Vanilla is probably my favorite flavor so I think this is a really good combination. Now you make me hungry! I was shown the rabbit in the moon at a young age so I always see it. For a long time I couldn't see the Man in the Moon but now I can toggle back and forth. Those cookies look delicious! It's a chilly 81. Yesterday it was 95-ish. However, the need for cookies knows no season. These cookies look delicious! They're so pretty, Melissa! 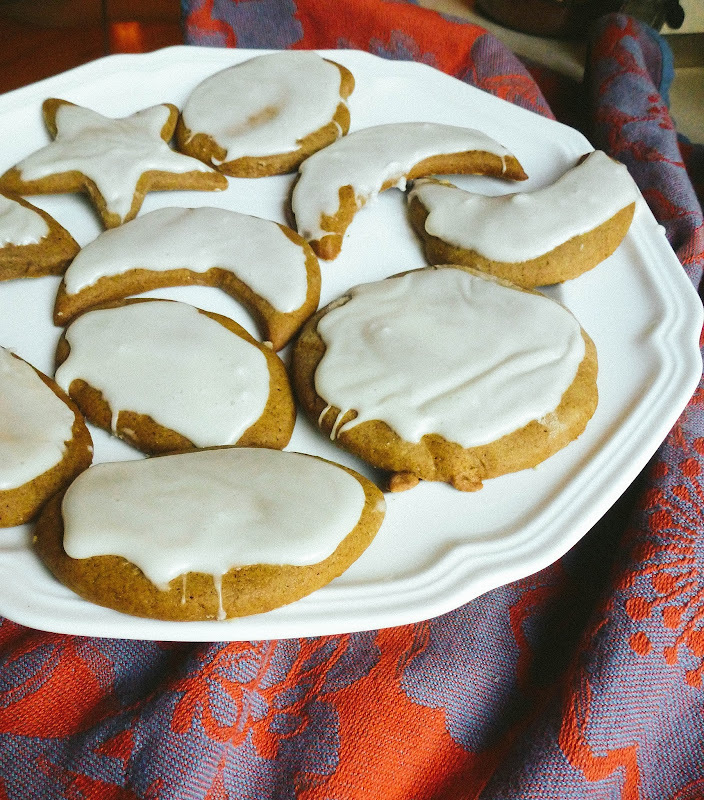 We almost made gingerbread cookies this week-- though not from scratch-- don't hate me! But a certain 5 year old wanted gingerbread people and frosting and candy to decorate them with... all of which wasn't going to happen in the 5 mins we had before back to school night :) So-- they were abandoned!! Yours look sooo delicious! I like the way your kidlet thinks -- she's on the fast track to Christmas!! I hadn't thought of that. You're right!!! !